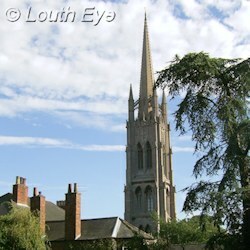 No website about Louth would be complete without an image of the parish church of St. James. When this was built in 1522, size really was everything. 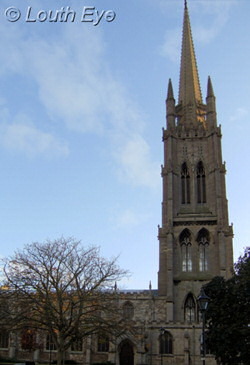 In the past Louth was much larger than many of the surrounding towns such as Horncastle and Market Rasen, and the spire of St. James is a reminder of the wealth and status of its former citizens. 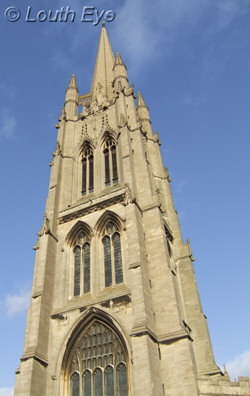 The spire was completed around 1515 and stands 295 feet high. 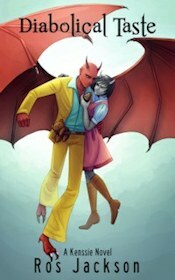 But that wasn't enough for the townspeople of Louth. Soon after they had created this masterpiece King Henry VIII was planning to dissolve the monasteries and rake in all their wealth for himself. So in 1536 the Pilgrimage of Grace began in Louth, only to end the next year with the deaths of the ringleaders. The church is floodlit by night, making an attractive (if somewhat ecologically unsound) sight that's visible for miles around. Look out for the gargoyles on the side of the church, which have been carved in the likeness of former vicars. 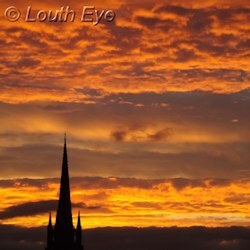 Click here to learn more about the other churches of Louth. Lincoln Cathedral is one of the city's most impressive tourist attractions. 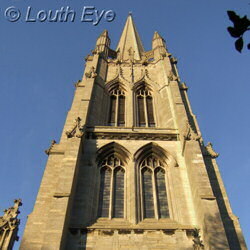 There are a number of noteworthy churches in Louth that are worth a visit.